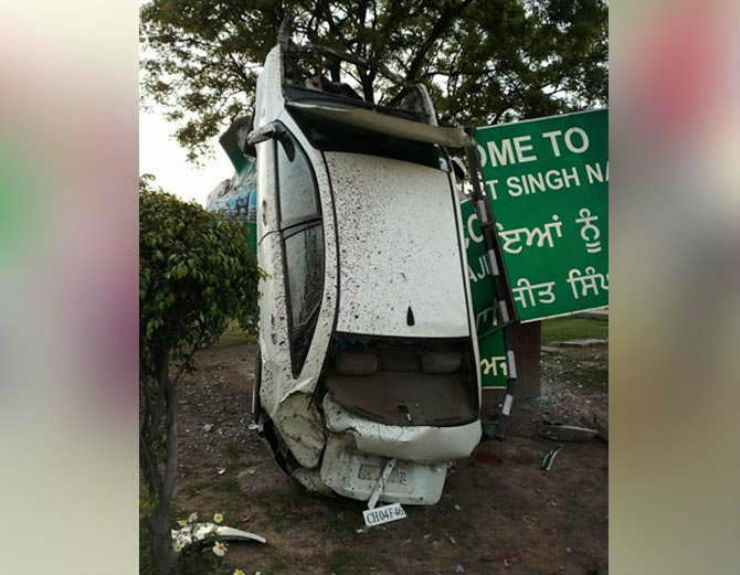 Two people were injured in a car accident in Mohali, Punjab yesterday when the car lost control and hit an electricity pole, which bent – allowing the car to ride almost straight up and come to rest, against the wall of an Octroi collection counter. According to some reports, the car may have been overspeeding. The sedan came to rest almost at 90 degrees to the ground and reated against a signage board and wall, supported by the bent metal electricity pole. As per reports, the vehicle was at a high-speed when the driver was surprised by a stray cow. To avoid an impact with animal, the driver veered hard and this is the result. Some reports say the car hit a road divider, the front lifted up, and then hit the electricity pole. After th passengers were rescued, the car remained in the same position for a while and commuters clicked several videos and posted them on social media. The local police said that there were two occupants in the vehicle and both are out of danger. They are being treated for their injuries and an official statement is being taken from them. No one else has been injured in the accident but the car looks totalled. The sedan’s front and the rear has been disintegrated completely in the accident. However, the cabin looks intact. Even the occupants must have fastened the seat belts, which saved their lives. 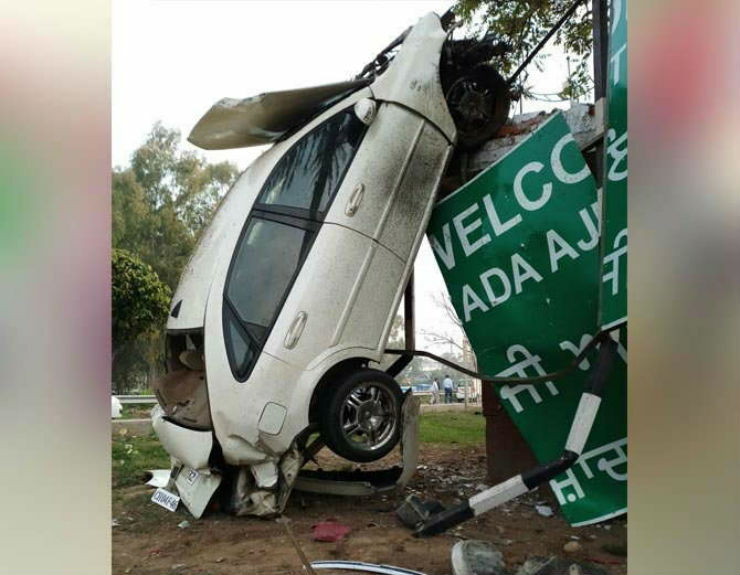 Overspeeding can be extremely dangerous on the Indian roads. It is extremely important to follow speed restrictions as they have been put in place after taking the surroundings into consideration. Why is overspeeding so dangerous? Overspeeding gives you less time to react. If there’s a stray cattle or pedestrian on the road, you get more time to react at a slower speed. Never over-speed inside the city limits, city roads are much more prone to such incidents where a stray animal or pedestrian walks suddenly on the road. On the highways, overspeeding can cause the vehicle to lose control easily. The car’s steering becomes much more sensitive and the body roll increases at high-speed making the vehicle susceptible the loss of control.